Hiya, Denise! Thanks for stopping by ... I'm reading the blogs of Benita's participants also! Hey Shelley - congrats on being a part of the Meet-N-Greet. I absolutely love your post. It's so you - both interesting and fun. I really enjoyed reading about how you started your love for quilting. Your work is amazingly beautiful and creative with just a little extra Shelley touch. Waving at you from AZ. Hiya, Linda! oh, a familiar face! :-) thanks for stopping by! I love the Lonestar that you have created. So nice to get to know more about you! And yep - I fell for the *in a weekend* thing to. Glad you finished yours! I'm glad I finished it also! I didn't realize it at the time, but not all tops get quilted. LOL! So nice to meet another addicted SABLE (Stash Accumulated Beyond Life Expectancy). I love making quilts just because I love the pattern or the fabric...and I really enjoy creating quilts with no pattern at all from my scraps! Your story made me feel like we are old friends EXCEPT that "quilt in a weekend" would have taken me MONTHS to make!! LOL That Lone Star is exquisite. I'm a fan of Ricky Tims and can definitely see the similarity to his work. 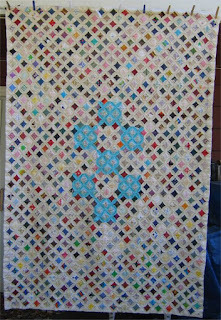 I absolutely used one of Ricky Tims' quilts as inspiration for those arched "caps" (or whatever they are called). I looked at *so many* Lone Stars for ideas because I really, really, really wanted this one to be very special. 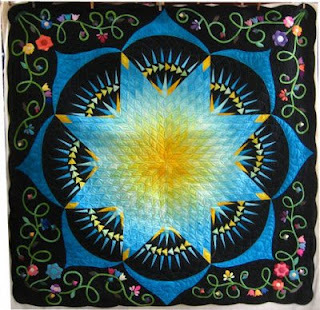 The Lonestar quilt is breahttaking...Such a work of art! Hi, Shelley -- we met some years ago on RCTQ or Stashbusters. (I remember your html website.) Nice to see you again in blogland and to get to know more about you. Hiya, Nann! I do remember Stashbusters! but dropped out of it quite a while ago. There were just too many ideas to absorb and I needed to concentrate on what I had to work on, rather than create new projects! I'm *STILL* at that point! LOL! Thank you, Tammy. It's been way too long that I've let it lapse. Thank you for stopping by! What a fun story about that weekend quilt. Wowza! I'm totally impressed. The lone star quilt is gorgeous. It was very nice to meet you, Shelley. Hiya, L.J. Who knew what that one "little, ol' project" would lead to? These days, a weekend project is practically instant gratification! Nice to meet you! Love this gorgeous luminous star! Thank you! Isn't that fabric absolutely astounding? I bless they day I found Tammy Salzman of 'Always Unique Hand Dyed Fabric'. She is such a wonderful person to deal with. I asked her if she could dye me some fabric to match a background color and she hit it spot-on. Highly recommended. Always fun reading your stuff. Great that you got an invite for this! Hey, Janna! I'm so pleased you stopped by! I love it when I get notifications of new content on your blog. *SUCH* an adventure ... but I'm glad it's you guys and not me! LOL! I am so flattered that you thought to include me! I am delighted to be a part of the Quilters Meet n Greet! Thank you. 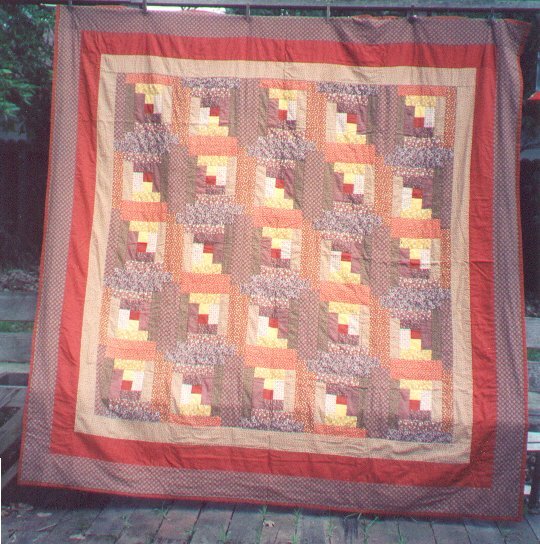 Shelley, I made that quilt from Family Circle too, for my parents-in-law. We lived in a logging camp and I had to finish mine before a float plane came in, so I worked through the night and ran out of backing material...and had to use a strip of yellow material to finish out the blue back. The quilt is about 40 years old and tattered, and we got it back when they died. It is now keeping my husband warm on his side of the bed! I still refer to the article and pattern that I had to put plastic over to keep it safe. It resides in a brown envelop and I panic if I can't find it and the directions as to finish the quilt. Thanks for the memories...we were young once not so long ago! 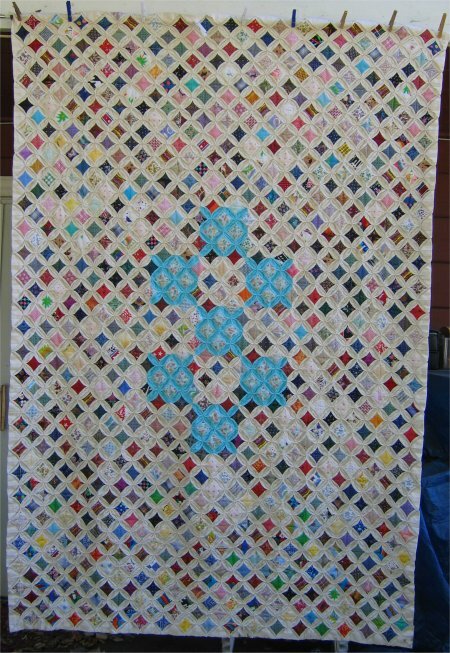 I enjoyed reading your Blog and seeing some of your beautiful quilts. Thanks for sharing. Nice to meet you! Your Lone Star is absolutely beautiful! I'm so happy that you visited my blog! Regarding the Lone Star .. I gotta say that the star of the show (pun intended!) is the hand dyed fabric. Tammy Salzman of "Always Unique Hand Dyed Fabrics" doe superb work. Wow....that Lone Star is really gorgeous. I am so impressed that you did a king sized log cabin. Hiya, Carole! Thank you for stopping by! Log Cabin remains one of my all time favorite layouts, probably because of that first quilt. It holds a special place in my heart. Thanks for dropping by! Hi, I'm amazed your finished a kind sized quilt in a weekend. Great work of a beginner that didn't know any different. Love your quilts. "... that didn't know any different." Isn't that the bottom line truth? It's also probably the reason so many things get done the first time! LOL! HaHa. Bruce is going stir crazy cause he's without a project until our company comes next Sat. OH NO! Set him to polishing the silverware. That was my job for the holidays and when company came. Geez, but I hated doing the forks ... all those stinkin' tines! What a fun post! And you're so right - that quilt does glow. And I'm blown away that you made a king-sized quilt in a weekend - talk about wonder woman! Thank you for inviting us to visit. What a blast to the past...Family Circle! Looks like they didn't lie either...you became a quilter that weekend. Stunning lone star quilt. I do love hand dyes and the special look they give a project! I found it hard to choose a favourite quit of yours, but the Kanji Peace might sneak into #1. And then the Tin Lizzie suggestions, I have a very, VERY old Gammill with a wooden frame, and the side tensioner triangles would be a winner. You have such a delightful story. The cathedral window pattern is my absolute favorite. Thanks for sharing with us.